Hurricane Barbara recently made landfall along the southern Pacific coast of Mexico and NASA's TRMM and Suomi NPP satellites captured rainfall rates within the storm, and a night-time image of landfall. 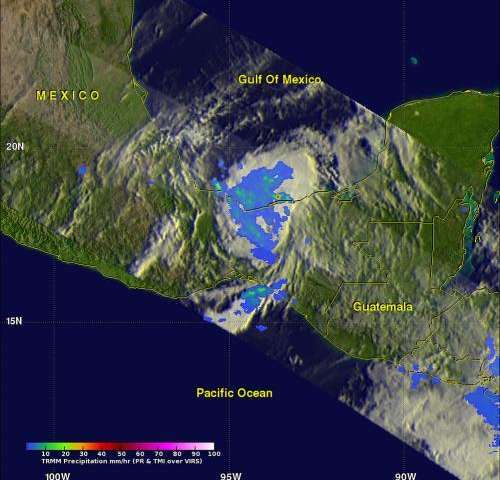 NOAA's GOES satellites provided images that were made into an animation showing the landfall and movement across Mexico into the Bay of Campeche on May 31. According to the National Hurricane Center (NHC), the center of Hurricane Barbara came ashore around 19:50 UTC (12:50 p.m. PDT) on Wednesday, May 29 about 35 km (~20 miles) west of Tonala, Mexico. At landfall, Barbara was a minimal Category 1 hurricane with maximum sustained winds of 75 mph. The Visible Infrared Imaging Radiometer Suite (VIIRS) instrument aboard the NASA-NOAA Suomi NPP satellite captured a nighttime image of Hurricane Barbara before it made landfall in southwestern Mexico. The image was taken on May 29 at 08:22 UTC (4:22 a.m. EDT). In the image city lights from Mexico City and Coatzacoalcos were seen to the north and east of Barbara's center. VIIRS, a scanning radiometer, collects visible and infrared imagery and radiometric measurements of the land, atmosphere, cryosphere, and oceans. NASA and the Japanese Space Agency's Tropical Rainfall Measuring Mission (TRMM) satellite captured several images of the storm during the landfall. TRMM captured the first image of Barbara several hours after it made landfall. The image was taken at 6:46 p.m. PDT on May 29 (01:46 UTC, May 30) and showed the horizontal distribution of rain intensity within the storm. The rainfall images were created at NASA's Goddard Space Flight Center in Greenbelt, Md. To make the image, several data products from various TRMM instruments are combined. Rain rates in the center of the swath are from the TRMM Precipitation Radar (PR), and those in the outer swath are from the TRMM Microwave Imager (TMI). The rain rates are then overlaid on infrared (IR) data from the TRMM Visible Infrared Scanner (VIRS). As is typical, after making landfall Barbara began to weaken and was a tropical storm with winds reported at 60 mph at the time of the first TRMM image. The image showed no evidence of an eye and areas of mostly light to moderate rain within the storm. Localized areas of heavier rain are evident inland northwest of the center and along the coast where the storm's circulation is drawing moist air ashore. 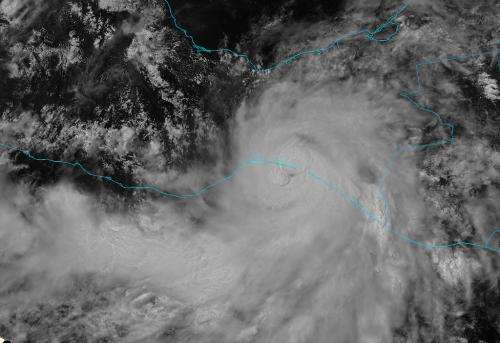 After making landfall, Barbara continued in a mostly northward direction across southern Mexico and began to emerge over the southern Gulf of Mexico. The second rainfall image from TRMM was taken at 09:58 UTC (2:58 am PDT) on May 30. By that time, the National Hurricane Center had downgraded Barbara to a tropical depression with maximum sustained winds of 30 knots (~35 mph). Most of the rain associated with Barbara at that time appeared to be light with a smaller proportion of moderate rain than before and only an isolated area of heavy rain along the Gulf coast side. TRMM data was used to create a 3-D image to look at precipitation and cloud heights. Most of the cloud tops were of low to moderate height with the exception of the one taller towering thunderstorm that reached up to around 12 km. This convective tower was associated with an area of heavy rain. In order for the storm to regenerate or maintain itself, new areas of convection like this would have to occur near the center. NOAA's GOES-14 satellite captured Hurricane Barbara's landfall in southwestern Mexico and movement across land, northward toward the Gulf of Mexico. 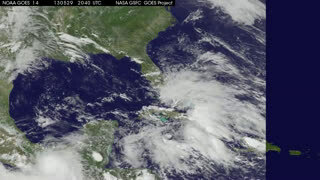 In a 43 second animation of NOAA's GOES-14 satellite observations from May 29 to 31, 2013, Barbara made landfall at the beginning of the animation, and moved toward the Gulf of Mexico by May 31. The images from May 31, showed scattered showers were occurring over the Bay of Campeche and in the coastal city of Coatzacolalcos reported light rain. The animation was created by the NASA/NOAA GOES Project at NASA's Goddard Space Flight Center. On May 30 at 22:00 UTC (6:00 p.m. EDT), Barbara was a tropical depression with maximum sustained winds near 20 knots. It was centered about 127 nautical miles north-northeast of Tehuantepec, Mexico and was moving north at 4 knots. By Friday, May 31 at 8:05 a.m. EDT, the National Hurricane Center (NHC) noted that a weak upper level trough (elongated area) of low pressure extended over the western Gulf of Mexico is steering the remnants of Barbara. Barbara's remnants had weakened further into a trough of low pressure at the surface and stretched from 19 north latitude and 94 west longitude to 22 north and 93 west. NHC reported that the weak mid-level circulation associated with Barbara continues to gradually dissipate and become embedded within southeasterly flow over the western Gulf of Mexico. The East Pacific hurricane season officially begins on May 15 and runs through November 30.